June 1994 saw the 25th anniversary of Gabriel Woolf s involvement with the George Eliot Fellowship, working with and for the Fellowship in its efforts to promote interest in George Eliot's life and works. We are very fortunate that George Eliot is, and always has been an important element in Gabriel's professional life as an actor and reader, for the partnership has been a particularly happy one. It was very propitious that Gabriel was reading on BBC Radio his highly acclaimed adaptation of Middlemarch in an unprecedented 50 episodes just as we were seeking someone to open an exhibition marking the 150th anniversary of George Eliot's birth. 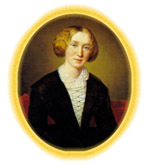 We were to discover how fortunate almost at once; we had made our first contact with a man who had been commissioned to present a radio portrait of George Eliot for the BBC and one whose devotion to and understanding of the novelist was to enrich our own work for a quarter of a century.